Action for Rural Women’s Empowerment (ARUWE) is a non-profit, Non-Governmental Organization working with marginalized groups of people especially the rural Women poor farmers and children in Uganda. ARUWE evolved from Nsangi Rural development Association (NRDA) which was originally founded in 2000 as a community based organization working on Women Empowerment. In April 2008, ARUWE was fully registered with the purpose of improving the livelihoods of the rural marginalized Women farmers and their children through food security and environment, health, economic empowerment, human rights and HIV/AIDS. ARUWE is a member of the National Association of Women organizations in Uganda (NAWOU), DENIVA, UWASNET-(Uganda water and sanitation Ngo network) and Icon partners and Climate Action Network Uganda. To support and advocate for the needs and rights of marginalized rural poor women and children to enable them initiate and manage their own socio-economic and development processes. ARUWE has been in partnership with Wheels 4 Life for close to three years now to support Community Health Educators (CHEs) with bicycles to ease their mobility as they carrying out the work of sensitizing communities. 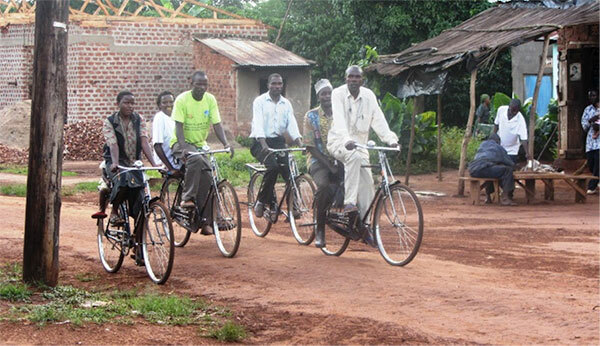 In May 2013, Action for Rural Women’s Empowerment (ARUWE) received funding of 5,000 USD from Wheels4Life to support Village Health Teams (VHTs) on Mulagi Sub County, Kyankwanzi district with bicycles. This was aimed at easing their movement as they carried out health and hygiene trainings and monitoring and distribution of medicines. VHTs are voluntary community structures instituted by the government to provide health services to the rural communities. They are referred to as the health center 1. ARUWE values and works with community structures to carry out programs in the community for ownership and sustainability purposes. VHTs are one of the structures ARUWE works with for health promotion and HIV/AIDS awareness campaigns in communities. 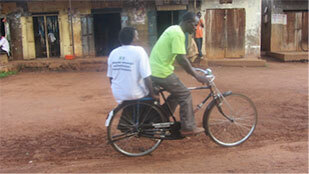 With the kind support of Wheels4Life, 50 VHTS in Mulagi Sub County have bicycles to increase efficiency. 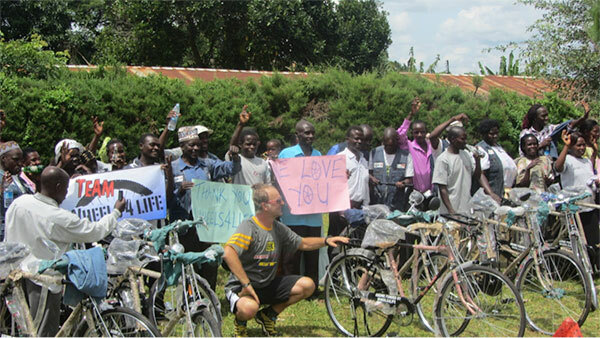 Carmen together with her husband Hans came to Uganda to hand over the 50 bicycles to the excited VHTs. The handover ceremony was attended by all the 50 VHTs, three ARUWE staff, the district and local community leaders and the Wheels4life family. After receiving their bicycles, a bicycle race was organized in which the VHTs competed especially against Hans. It was so interesting the see the joy of the community during this activity. My name is Matthias. I am 35 years old. To me receiving a bicycle showed that there is someone out there who appreciates the work of VHTs. We are voluntary workers that are neither paid by the government nor any other organization. The bicycle has eased movement to treat and offer medicine pregnant mothers and their children, it is now easier to pack and carry documents while conducting my field/ home visits and I have grown to appreciate ARUWE and Wheels4Life for this great service given to my community. I thank everyone who made it possible to ease the work we do. 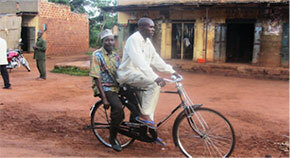 He says, “To me, the bicycle has eased work of picking medicine from the hospital. Before I received this wonderful bicycle, it would take me 4 hours to walk to and fro to collect the medicine; now it takes less than 30 minutes. Following up on patients is now easy and in cases of emergency, it is easy to take the patient to the health center. Delivering my VHT parish report to the health center and capturing health related information in my community has also been made easy. The bicycle has also simplified work for instance moving to the garden with the family, carrying food home, going to the market and among others. We are grateful that this has also increased our visibility and importance as VHTs in the community and ARUWE as a development partner is highly esteemed in our community”. Felician is a communication coordinator among the VHTs in Kalagi parish. “Since we received the bicycles, mobilization of my fellow VHTs for our meetings, community health campaigns, etc has been made easy and since most of them have bicycles they respond in time too since they have means of transportation. I can now also transport sick community members especially the elderly to the health center so we call them bicycle ambulances. The bicycles have reduced a lot of time and physical energy in walking that we used to invest in our work the example is in activities like immunization, antenatal and postnatal, research on HIV/AIDS, etc. We could take months to do such work and as a result we could not keep up with some deadlines. Now we are able to accomplish out tasks in time. This has also established our Mulagi Sub county VHT structure as a model in the region Kiboga, Kyankwanzi and Kibaale districts. Other NGOs and the Government have now engaged us in more development areas and built our capacities because we have bicycles to use of our work”. Jane a community residence of Kigando A village said that it was important and of great benefit to her entire community to give the VHTs bicycles because her community then got better and quicker health services. She added that more people have also been attracted to join the village health teams. The more a community had more VHTs, the better it was in realizing better delivery of health services. Brian a community elder of Nakabiso village said, “I was so happy that I received quick health services from my grandchildren. The VHTs assigned to my home now visit more often at least one in a fortnight un like before when I could even take a month out their visitation. Our village especially the youth are continuously been supplied with condoms which helps to reduce on the spread of HIV, STDs and STIs”. Mr. Timothy Kafeero – the Mulagi Sub county Chairperson 111 thanked ARUWE and Wheels4 Life for the great support to his community especially in the improvement of health service delivery because of facilitating VHTs with bicycles. It has also promoted consolidated effort in development activities as health, development, production and other government programs addressed in all sectors. We are glad to say that the VHTs have taken care to maintain their bicycles to be in good use because they know that their communities depend on them.